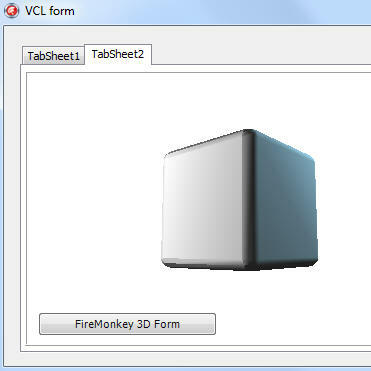 There is a free component available called TFiremonkeyContainer which allows you to embed a Firemonkey form inside of your normal Delphi VCL based application on Windows. This could allow you to leverage the power of your existing Delphi VCL source code and at the same time write new code with Firemonkey. It would also let you re-use forms that you use in your Delphi Firemonkey mobile apps directly in your Delphi VCL applications on Windows. The component is from David M. over on his blog and the example he shows is of a Delphi Firemonkey 3D form embedded in his sample Delphi VCL based Windows form. Apparently there could be some bugs in it still but he did one round of bug fixes already. It looks like it works in Firemonkey 2 and Firemonkey 3 but maybe not Firemonkey 1 which shipped with XE2. So it supports Delphi XE3 through Delphi XE5 it looks like. Head over and read the write up about the component. He also has an older post with the first release of the component. Or just download the TFiremonkeyContainer directly from Google Code. how can i embed the child form in the main form’s panel? Use a TFrame instead of a TForm for the second form.